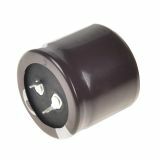 Capacitor 22µF, 420V, B25838-K4226-K4 Capacitor with capacitance 22 uF and voltage from 420 V to 600 V.
Electrolytic capacitor G.LUXON 608B (M), 25V, 1500uF, Ф13x25mm Electrolytic capacitor with voltage 25 V, capacitance 1500 uF and operating temperature -25°C to +105°C. 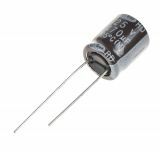 Electrolytic capacitor 450V, 4.7uF, Ф10x21mm Electrolytic capacitor with rated voltage 450 V, capacitance 4.7 uF and operating tempearture from -25 °C to +105 °C. Electrolytic capacitor 450V, 10uF, ф12.5x21mm Electrolytic capacitor with rated voltage 450 V, capacitance 10 uF and operating tempearture from -25 °C to +105 °C. 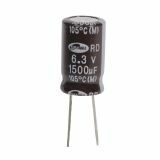 Electrolytic capacitor 160V, 4.7µF, Ф6.3x11mm Electrolytic capacitor with an operating voltage of 160 V, 4.7 uF nominal capacity and operating temperature 85 °C. Bipolar, electrolytic capacitor 0.33uF, 250V, THT, Ф8x12mm Bipolar, electrolytic capacitor with an operating voltage of 250 V, 0.33 uF nominal capacity and operating temperature 85 °C. 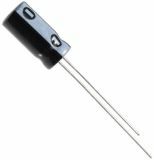 Electrolytic Capacitor 0.47uF, 100V, THT, Ф5x12mm Electrolytic Capacitor with rated voltage 100 V and capacitance 0.47 uF and operating temperature - 85 °C. Bipolar, electrolytic capacitor 0.47uF, 250V, THT, Ф8x12mm Bipolar, electrolytic capacitor with an operating voltage of 250 V, 0.47 uF nominal capacity and operating temperature 85 °C. Electrolytic Capacitors ( or aluminum capacitors ) are capacitors in which one of the two plates acting as an anode and a cathode, is a non-metallic substance called electrolyte. 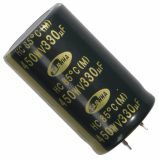 This type capacitors consist of two, wound on spools, thin aluminum foils - one of which is covered with a thin layer of aluminum oxide, such as insulation and wrapped in waxed paper soaked in electrolyte. This constitutes the anode in the condenser. The other aluminum foil roll , together with the liquid electrolyte represent the cathode. Both rolls together with liquid electrolyte are encapsulated in hermetically sealed housing. Depending on the location of external terminals, electrolyte capacitors are axial and radial. Electrolytic capacitors also can be aluminum and tantalum . They are widely used in high-voltage circuits and low-frequency (low pass) filters , as well as in almost all types of electronics equipment. Vikiwat Ltd. is a direct importer of a wide range of capacitors and more than 23 years offers to its customers proven quality products with attractive prices. Welcome to visit us or shop easily in our online store with fast delivery directly to your home!